Photographer Nicole Struppert is not only a photographer, but also the Editor of the Women in Photography blog. She’s been running it for a fair amount of time now, and continues to update it and profile the work of fantastic women photographers. On a more personal basis, Nicole and I have been friends for a while and I’ve been working with her to help build the site. We feature a lot of photographers here, but not a whole lot of bloggers. And in a situation like this, I find what Nicole is doing to be particularly interesting. So we’ve interviewed you and featured your work here before. And since the last time we’ve done an interview together you’ve launched the Women in Photography blog. I’m a follower and I think that anyone will be inspired by the work there. But what made you want to start the site? When I started my own career as a photographer, I never thought about starting a platform like Women in Photography. But after a while being in that business, I noticed that female photographers are under represented in the world of photography. Photo agencies, brands, and advertisements support men more often than women and I started to ask myself, “why is that?” There are brilliant female photographers and it was time to show the world that also women have a great eye and instinct for photography. We’re both photography blog editors and I think we both understand now the difference between showcasing “good photography” and not so great work. So in your eyes, what’s considered good work? And further, when someone comes to Women in Photography, what should they expect? For me a good photograph is a picture that touches me. That could be in different ways – a great visual composition, colors, textures, a great story or an image where I can find new details over and over again, whenever I take a look at it. When I am looking for work to present on Women in Photography I am looking for different things. That could be a unique visual language, a great project or story – work that inspires people. You do this blog part time as one of your projects, so what do you feel is the toughest part of doing a blog part time and trying to grow it when it doesn’t have 100% of your attention? Well, it is tough and sometimes a real juggle. Last year I was pretty busy and at the end of the day I had the feeling that I haven’t committed to anything at 100%. In the beginning of this year I decided to change a few things in my life and focus just on my own work as a photographer and on Women in Photography. Both are related to each other and I hope it makes everything a bit easier now! You and I have had a relationship of trust over time. We’ve emailed back and forth: you write letters in classic German/European style and I struggle to get back while staying on top of my emails and fighting near crippling astigmatism. So when it comes to developing partnerships with other blogs, what made you want to work with the Phoblographer? Yes, you are right, we have a good relationship of trust over time and I really appreciate that. We met in person and write emails, and out of that our partnership grew; and actually this is the best example about what makes me want to work with other photo blogs. I am looking to have a good relationship and balance with people I am working with. I like to support other photographers, and I totally appreciate if they do the same for me. This is what makes us and our projects grow. When we sit there and we look at some of the most famous women photographers, obviously there are more men than there are women. So what are your candid feelings on the industry these days? As a young, feminist man, I feel like that balance is starting to even out but I feel like we’ve got a long way to go. At least here in NYC too, most of the reps and marketing people for the photo galleries that we work with tend to be female dominated. Why do you feel that is? I’m really curious because you’ve been in marketing for far longer than I have been. Yes, that is a fair point, but to be honest, I don’t have an answer to that as well. I think there are many reasons. One could be, that the life of a photographer/artist isn’t an easy one, so perhaps men are more encouraged to go this challenging path. It also could be that some women don’t want to expose themselves constantly to the critics of gallerists, editors, or the public so they find a related way to live their passion. So how do you want to grow Women in Photography? What are your ideas on how to create more content besides just interviews featuring strong female artists? When I started Women in Photography I just wanted to build a platform to show the work of female photographers to a global audience. But now I feel it’s time to grow this platform and support female photographers with more information and inspiration. I am currently doing some research with female photographers on what they would like to see on my website. For now, I got some requests to publish camera reviews from the view of a female photographer, and give marketing tips and information about contests and fellowships. Another suggestion was to publish interesting photowalks in different cities. I will do a survey on the Facebook site of women in photography. All members are very welcome to take part and come up with more ideas. Do envision a day in the next 10 years when we won’t need a website like “Women in Photography?” I mean, it’s purpose is to profile the work of fantastic women in the art scene. It’s at least my hope that everyone will have equal profiling but not at the expense of showcasing good photography. Women in photography will hopefully always be a site to inspire and motivate photographers. It’s a platform for women – but my goal is to inspire EVERYONE who is interested in photography. 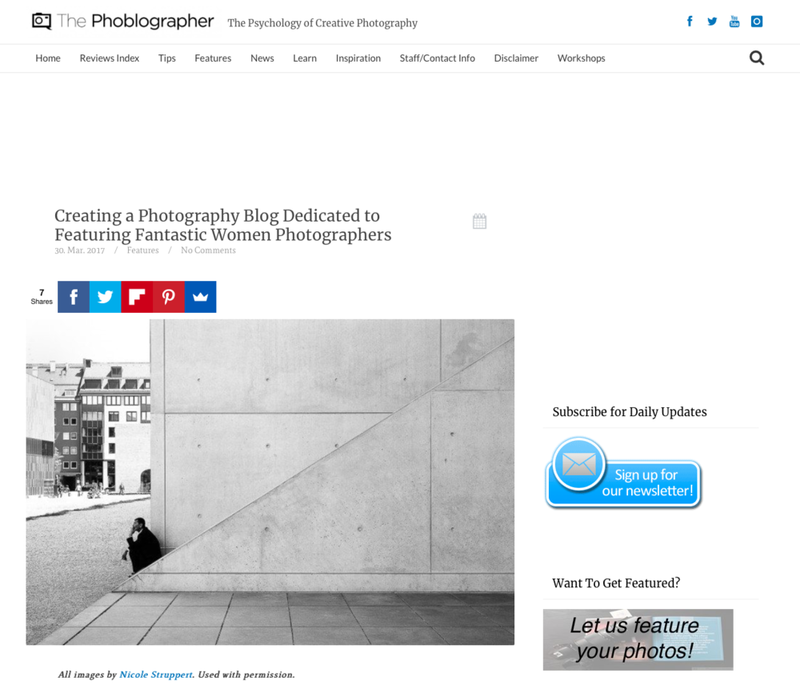 Be sure to visit the Women in Photography blog for more.